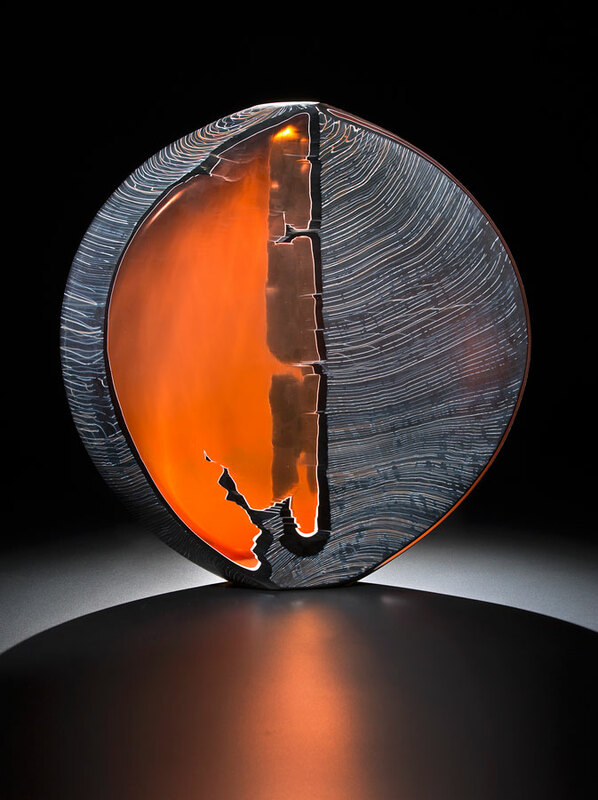 Ethan Stern’s luminous, often asymmetrical blown and carved glass sculptures demonstrate his exceptional ability to bring form, color, texture, light and line together to create a balanced dimensional composition. 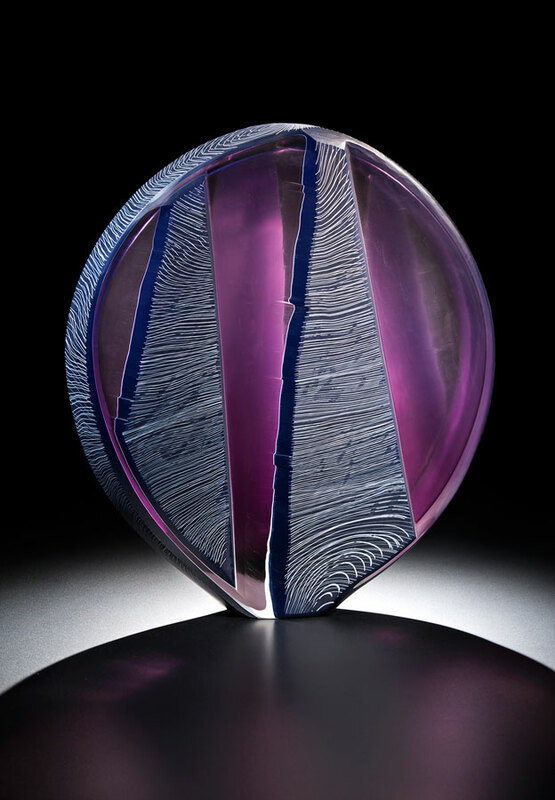 He works from his Seattle studio, and his sculpture is in numerous museum collections. 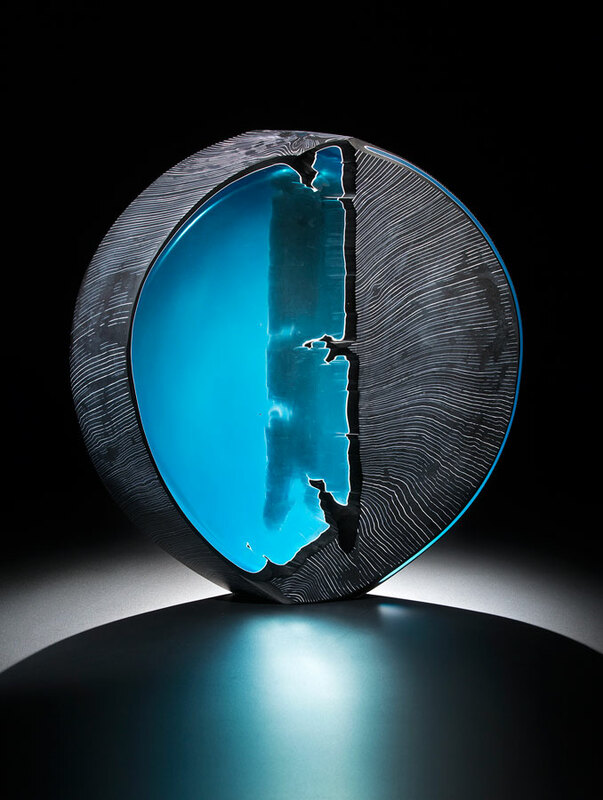 Ethan is represented by Traver Gallery in Seattle, Washington, where he is the featured May artist with a new body of work. 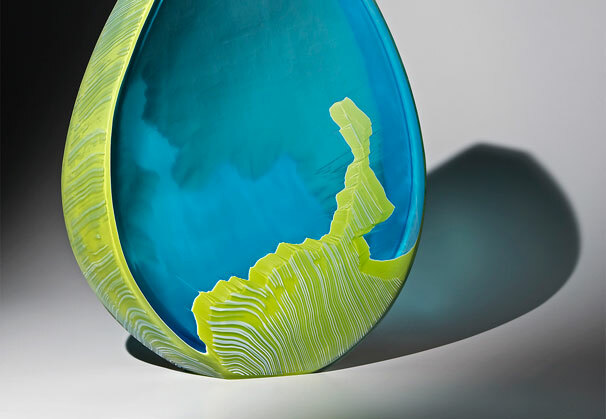 Pushing blown glass beyond the anatomy of the vessel, my work is an ongoing exploration of abstraction, color, texture and light. I employ these ideas to help answer questions about how we see our environment, the objects we use everyday and the spaces we occupy. Translating this information into my recent work has led to imagery and form inspired by the intersection of geography, architecture, and industrial design and how it can influence the visual deconstruction of our surroundings. Stuck between the constant push and pull of the engineered and natural landscapes around me I can only hope to better express how these relationships impact us. 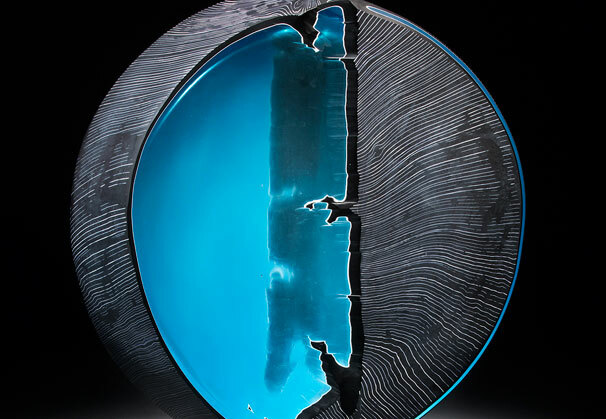 While blown glass typically reflects light and has an inherently shiny and dense appearance, I have become attracted to a richer, more luminous effect that can be achieved by carving and engraving the surface. 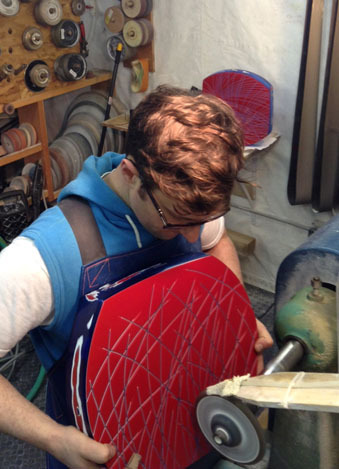 I begin each piece by creating a geometric blown form composed of multiple layers of color. 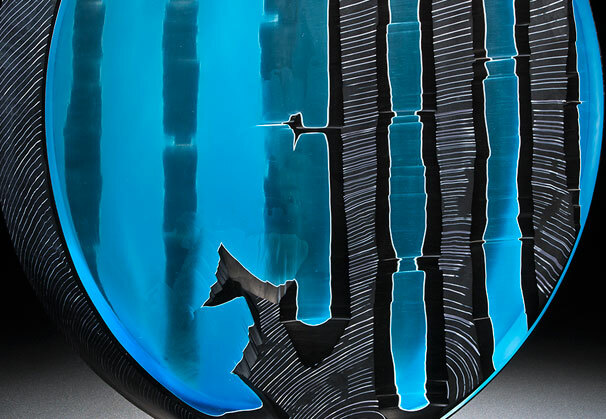 Once the glass is cooled I cut into the surface with diamond and stone wheels to create pattern and texture. 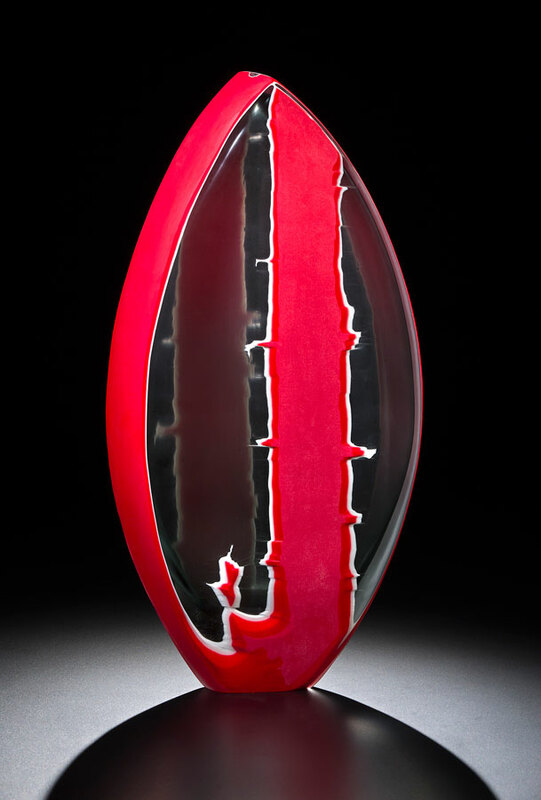 These engraved marks, like the stroke of a paintbrush on canvas or a finger pushed into clay; leave evidence of my hand and are undeniably connected to my process and the nature of the material itself. 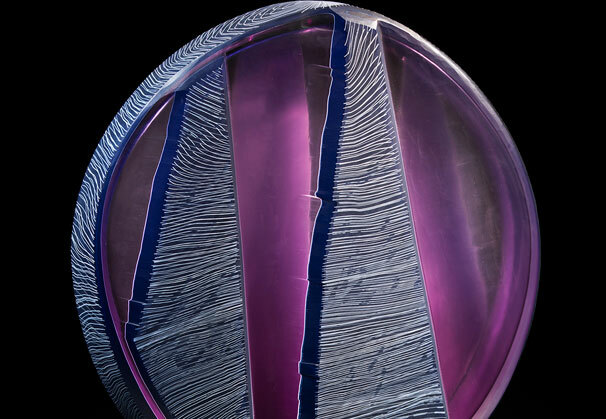 Feeling no ownership of the techniques I employ, it is the revealing quality of carving that attracts me to this method of manipulating glass. Born in Ithaca, New York, Ethan Stern currently lives in Seattle, WA. 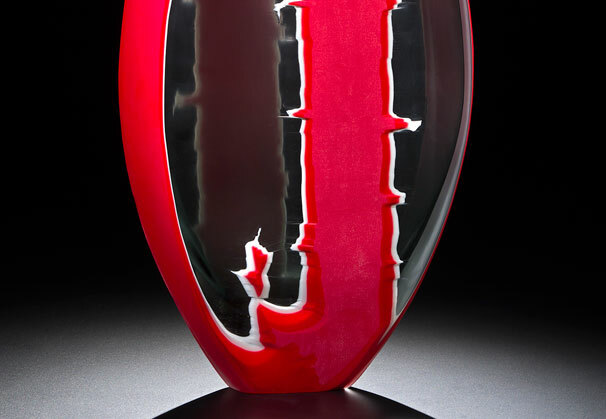 He earned his Associates degree in Ceramics at TAFE College in Brisbane Australia and his BFA in Sculpture and Glass from Alfred University. 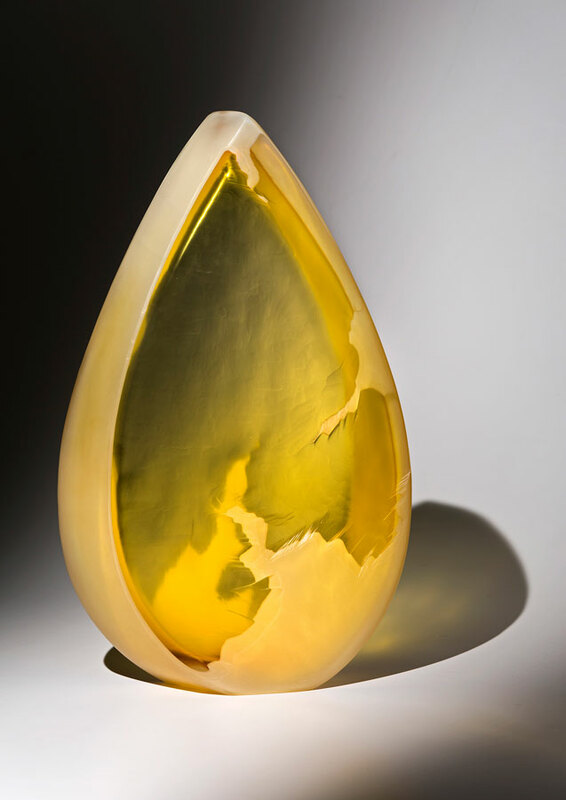 Stern’s work is widely exhibited and is currently featured in the collections of The Eboltoft Glass Museum in Denmark, The Museum of American Glass in New Jersey and The Palm Springs Art Museum, in California. 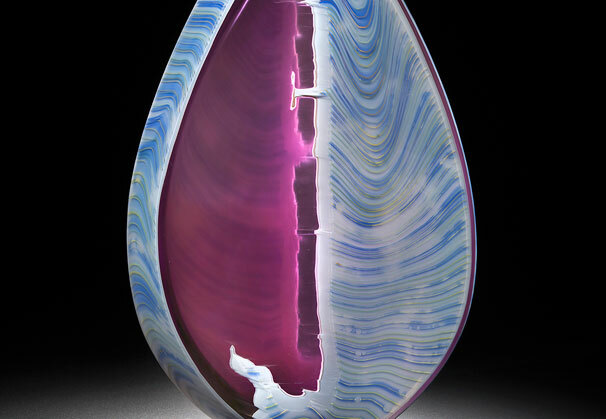 Ethan has taught sculpture in glass at the University of Washington, Pilchuck Glass School, Pratt Fine Arts Center, The Penland School of Craft and the Pittsburgh Glass Center. 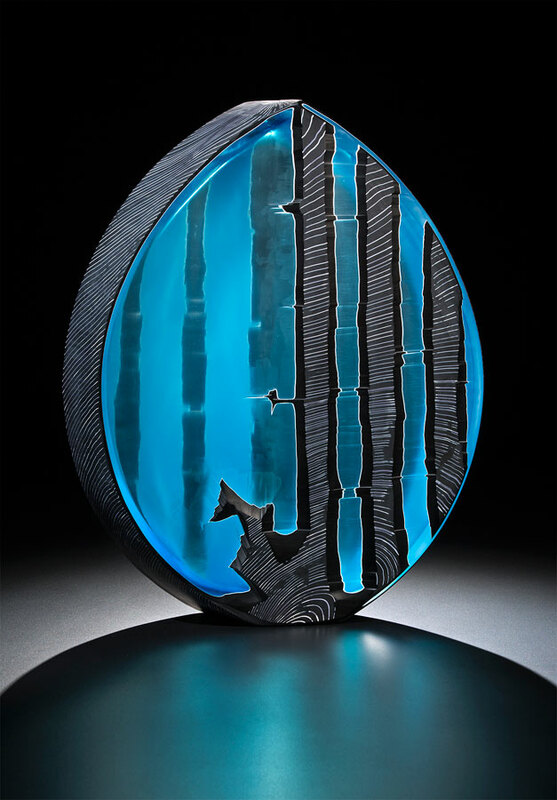 Ethan's luminous, often asymmetrical blown and carved glass sculptures demonstrate the artist's exceptional ability to bring form, color, texture, light and line together to create a balanced dimensional composition. 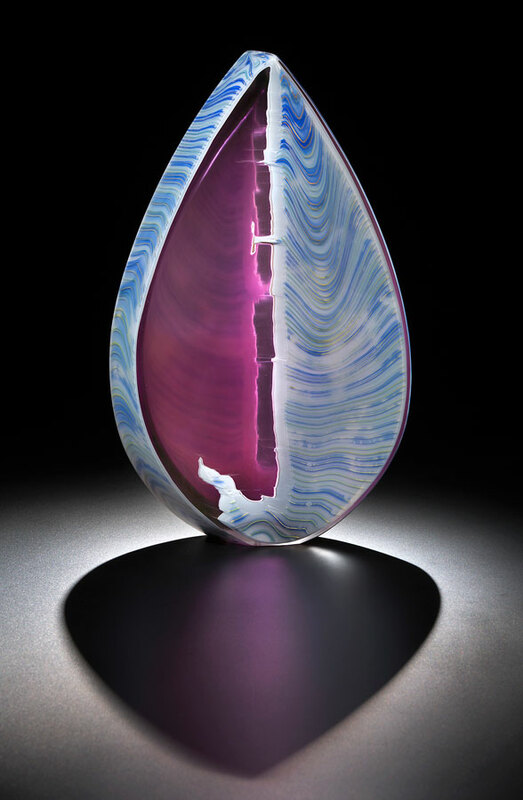 Drawing from both natural and industrial patterns, Stern begins each piece by creating a blown, geometric sculptural form composed of multiple layers of color and pattern. 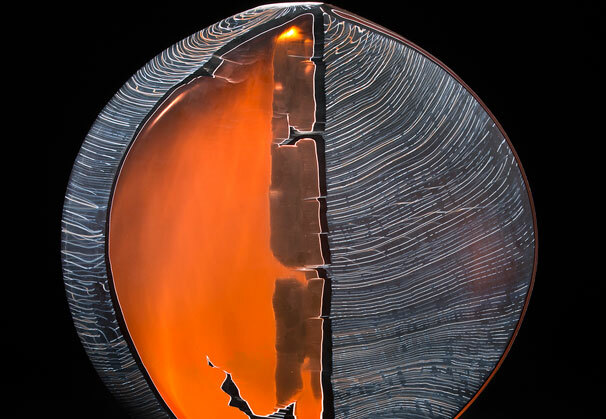 The contours of his sculptures are deceptively simple; the meticulous execution of the crisp edges and contoured carved lines reveal an extraordinary technical mastery. His engraved marks, like the stroke of a paintbrush on a canvas, create an expressive sense of rhythm, motion, weight and depth. 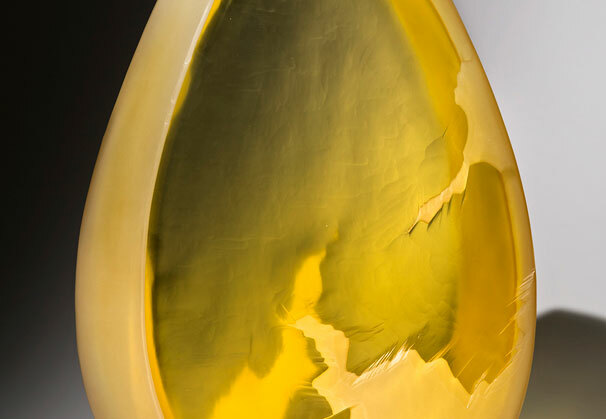 The carved surface of the surface of the glass reveals a soft matte texture that absorbs light, gives the work a softly radiant quality, and a richly textured tactile surface. 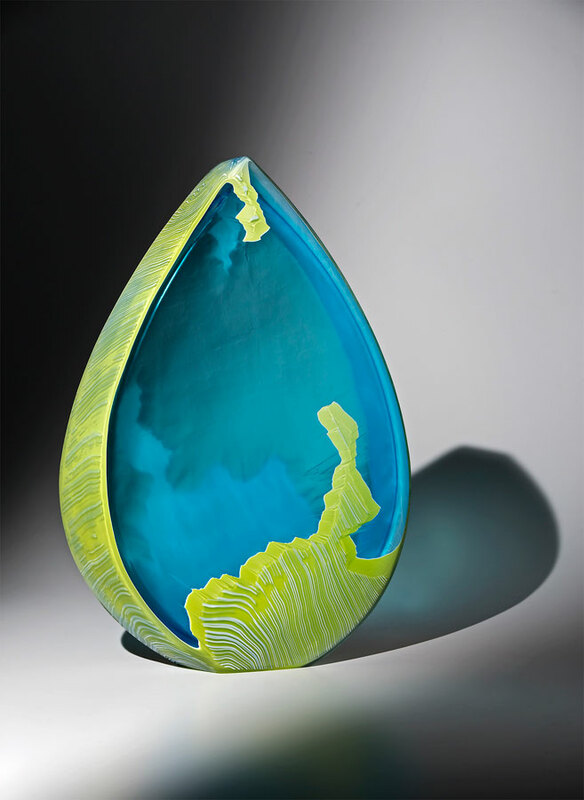 We are grateful to Traver Gallery, Seattle, Washington, for providing the materials for the Artist of the Month.